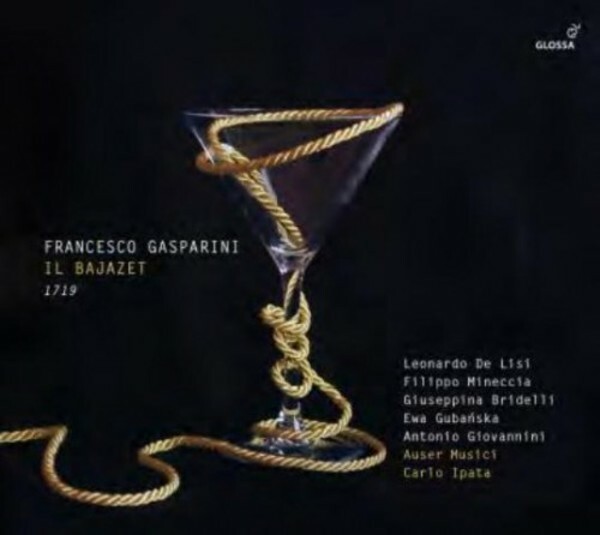 Carlo Ipata, inveterate searcher out of unjustly forgotten musical scores, directs 'Il Bajazet', an important three-act opera by Francesco Gasparini, which shows marked influences of the Roman Arcadian School of the Baroque. Ipata conducts his own orchestra, Auser Musici, for this new Glossa recording, made in conjunction with performances which took place at the 2014 Opera Festival in Barga. The score used is that for the 1719 dramma in musica performed in Reggio Emilia, as updated by Gasparini to accommodate the starry Baroque talents of Francesco Borosini, Antonio Bernacchi, Marianna Bulgarelli and Faustina Bordoni. Their modern-day counterparts in Barga are Leonardo De Lisi (Bajazet), Filippo Mineccia (Tamerlano), Giuseppina Bridelli (Asteria) and Ewa Gubanska (Irene). There is also a cameo role for Raffaele Pe, whose Glossa disc 'The Medici Castrato' was released recently. Like other composers active at the very end of the 17th century and the start of the 18th, Gasparini�s music was swept aside by the talented activities of Vivaldi and Porpora (and the influence of Farinelli and Carestini), and of course of Handel, whose score for 'Tamerlano' (the earlier version of 'Il Bajazet' had been called 'Tamerlano') reflect very close readings of Gasparini�s own operas. In her booklet essay, Antonella D�Ovidio delves into the history of Gasparini�s 'Il Bajazet' and comments lucidly on the style of this neglected operatic master. Recorded in Barga (Chiesa del Crocifisso), Italy, from 29 June to 6 July 2014.